Arrival at Paro International Airport. Welcome and transfer to hotel. After refreshment, visit Paro Dzong, a fine example of the architecture of Bhutan. This temple is also known as the Rinpung Dzong, meaning "fortress located in a green jewelry." This impressive dzong to inwardly sloping walls were built in the 16th century on the foundations of a monastery built by Guru Rinpoche, who is regarded as the second Buddha. Walk to the Nyamai Zampa, an old traditional cantilever bridge in Bhutan. Then, visit a typical Bhutanese farmhouse. Walk in Paro. Overnight at hotel. After breakfast, drive to Punakha by the collar Dochula (3088m). 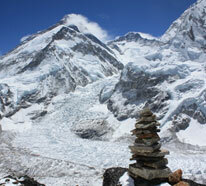 Panoramic view on the Himalayan mountains. Stop at 108 chortens (stupa) built on the hill by Her Majesty Ashi Dorji Wangmo (Queen of Bhutan) for the safety and well-being of His Majesty the King of Bhutan. Druk Wangyal Lhakhang visit the temple built to honor His Majesty Druk Gyalpo fourth, Jigme Singye Wangchuck. Continue to Wangdue. Visit the Dzong (fortress), located on a ridge overlooking a river junction. Then drive to Punakha, the former capital of Bhutan from 1637 to 1907 Enroute visit the monastery Devin du Fou - Chhimi Lhakhang, famous for its shrine to fertility. Then, visit the Punakha Dzong, located at the confluence of two rivers: the Pho - Chu (Male river) and Mochu (Female river). The Dzong was built in 1637 by Ngawang Namgyal Zhabdrung to serve as administrative and religious headquarters in the region. Visit Kuenray, living coronation of kings of Bhutan, Dzongchung at the entrance of the Dzong and cantilever bridge overlooking the Mochu which was recently renovated. Overnight at hotel. After breakfast, drive to Trongsa, residence of the royal family. Crossing forests of oak and rhododendron. Beautiful landscapes, scenes of rural life in Bhutan. Village Nobding and neck Pele The Stop. Chendebji at Chorten (Stupa) for a tea break. The route continues towards Trongsa. Check into your hotel. Visit the Museum housed in the Ta Dzong (watchtower). A museum in which aspects of Bhutanese culture and history are explained by beautiful objects. Watching a documentary on the history of Bhutan and the monarchy. Trongsa Dzong visit, the most impressive of Bhutan. Built in 1644 by the Shabdrung, the Dzong is an architectural masterpiece. Overnight at hotel. After breakfast, drive to Bumthang valley spectacular, considered the heart of Buddhism. En route, visit the Yathra weaving center in Zugney. Yathra is the name of the garment colored wool, hand-woven (often with geometric patterns) that is produced in this region. Continue to Bhumtang. Check into your hotel. In the afternoon, visit to Bumthang Jambay Lhakhang, built in the 7th century by King Songtsen Goempo Tibet. In its effort to propagate Buddhism, he had a plan to build a total of 108 temples in Tibet and neighboring kingdoms. Kujey Lhakhang the temple to the right is the oldest. It was built by Minjur Tempa in 1652, around the cave where Guru Rimpoche meditated and left the imprint of his body. Jakar Dzong, "castle of the white bird". The fortress is now used as an administrative center for the valley and summer residence of monks from Trongsa. Wangdicholing tee Palace was built in 1857 on the site of the camp battle Trongsa Penlop Jigme Namgyel (father of the first king of Bhutan). As the first king of Bhutan and the second made this palace their summer residence. Overnight at hotel. After breakfast, drive to the Valley Phobjikha. Visit Gangtey Gompa (monastery) which now houses the only Nyingmapa monastery in Bhutan. The valley is also the winter home of black necked cranes (Grus Nicorocolis), which migrate from remote areas of Tibet, China and Siberia during the winter to this valley. Phobjikha lunch. Drive to Punakha. Overnight at hotel. After breakfast, drive to Thimphu. Visit Takin reserve, home to the national animal, the Takin, exclusively present in Bhutan. Visit Tashichhoe Dzong fortress built in 1641 by Ngawang Namgyel Zhabdrung. It was rebuilt by Jigme Dorji Wangchuck Her Majesty between 1962 and 1969 The Dzong houses the secretariat building, the throne room and the office of the king, and the main monastic body. Then the Memorial Chorten built in 1974 to commemorate the third king of the country, King Jigme Dorji Wangchuck, widely regarded as the father of modern Bhutan. Kuenselphodrang, the largest Buddha statue in the world, is perched on the hill overlooking the Thimphu valley. Beautiful view. Overnight at hotel. After breakfast: Option 1: Visit the National Textile Museum where is preserved a collection of antique fabrics, rich colors and designs. Then, visit the National Institute of Traditional, where medicinal herbs are identified and traditional medicine practitioners are trained. After that, visit the Folk Heritage Museum, an outdoor museum that gives a glimpse of rural life, and the School of Traditional Painting, Arts and Crafts. Then visit the Hakhang Changankha. This temple overlooking the Thimphu valley was built in the 13th century by the famous Lam Phajo Zhigpo Dugom. After lunch, drive to Paro visit Kichu temple, one of the 108 temples built in the 7th century by the Tibetan King Gampo Songsten. 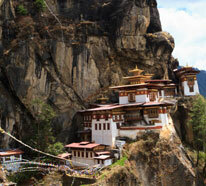 Option 2: Road to Paro and hike to Taktsang Goempa (Tiger's Nest Monastery). The climb to the viewpoint will take about three hours and from there you can enjoy a spectacular view of the monastery clinging to the cliff. Continuing the hike to the monastery will take about an hour. Legend has it that the 8th century, Guru Rinpoche flew on the back of a tigress from eastern Bhutan there and meditated in a cave here for three months. Taktsang was severely damaged by fire in 1998 but has now been fully restored. After lunch, back down to the road and back to the hotel. On the way back, visit Kichu temple, one of the 108 temples built in the 7th century by the Tibetan King Gampo Songsten. Overnight in Paro. After breakfast, drive to Paro airport for the flight back to Delhi. Small mountainside hotel with a magnificent view of the dzong and mountains. Friendly and attentive staff. Pleasant rooms and nicely decorated.